The Lace Museum is a small non-profit, all-volunteer museum with an extraordinary collection of lace from the 16th century through the 21st. 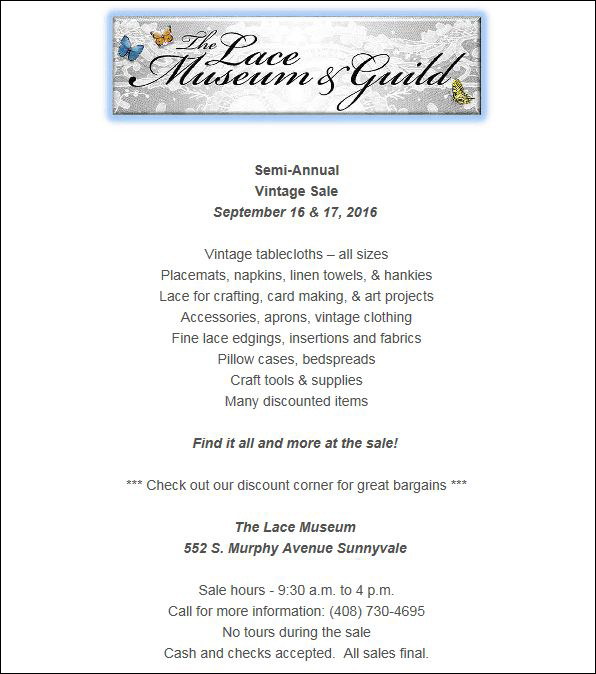 Twice a year the Museum holds a fundraising sale, including some fine laces. The Lace Museum houses tools, lace examples, books and other materials related to the history of lace. Our mission is to preserve and exhibit lace as well as offer quality lacemaking instruction. The Lace Museum is staffed entirely by volunteers, with no paid employees. The museum exists through donations, revenue from the gift shop and fees earned from teaching/speaking engagements. The Lace Museum accepts gifts in kind, monetary donations and gifts of intellectual property. Gifts in kind are screened to see if they fill a need in our collection. When items are not a good fit for our collection, they are sold to support preservation of our lace as well as operating costs. Our full donation policy can be found on our website.